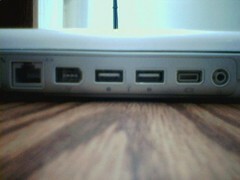 Well, the iBook is back in the shop, having succumbed to a bad DC-in port. The battery was down to 20% before I noticed that the AC adapter plug wasn’t working, and the thing went into power-save sleep before I could transfer data off it. I tried resetting PRAM and NVRAM, and when that didn’t work, I ordered a new 45W Apple iBook power adapter from an eBay retailer (they’ve gotten pretty cheap), and when that didn’t work, I tried yelling, and of course that didn’t work, so it was off to the Genius Bar. Turns out the Genius Bar runs on appointments now; you need to reserve a slot with the Apple Store Concierge. I reserved an afternoon slot, braved a crowded rush hour Metro (I never ride at rush hour anymore, and yesterday reminded me why), and got to the store ten minutes late. No more Geniuses at the Bar. But one of the staff must have seen my angry scowl, because he came to the bar and helped out. The repair will cost about $150 (which is $20 parts and $130 labor, as the Genius half-joked), and I get the iBook back sometime early next week. You know, looking back at all the problems this iBook has given me over the past three years literally from day one [1,2,3,4,5,6] I must say that it took getting a Mac to cure of me of being a Mac zealot. I can only recommend that if you do buy one, be sure to cough up the extra for AppleCare and some good external backup storage, because you’re probably going to need them. I certainly hope my next Mac fares better, though I still plan to hold on to this one, for sentimental reasons. This reminds me: I need to backup my laptop one of these days.